Long-term care comes with high costs, both for those who need care and the families who support them. With an aging population, many people in America will be receiving or providing long-term care in the future but haven’t yet prepared. 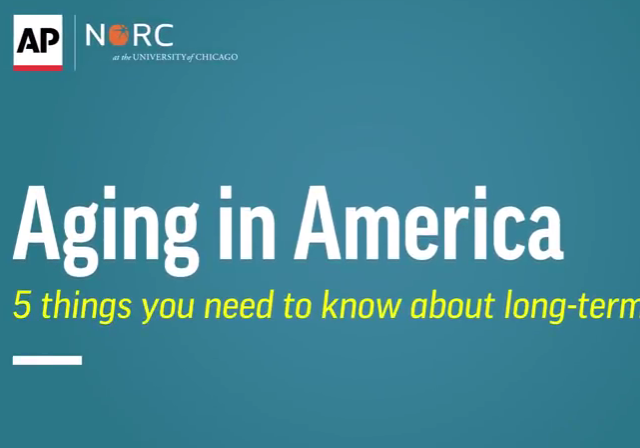 This video from The AP-NORC Center outlines five key things Americans should be thinking about when it comes to the care they may need as they age. Read More "Video – Aging in America: 5 Things You Need to Know About Long-Term Care (2017)"
In the next 15 years, America’s senior population is expected to nearly double, greatly increasing demand for basic long-term care services like cooking, bathing, or getting dressed. But many Americans are unsure about how these support services are financed. Keeping the costs manageable will remain a challenge for families and governments in the years ahead. This video interactive combines findings from the 2016 Long-Term Care Poll with a personal story of an aging woman and her caregiver. 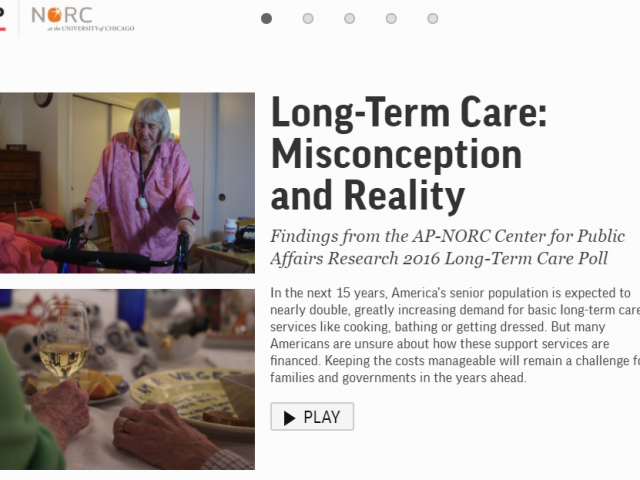 Read More "Video Interactive – Long-Term Care: Misconception and Reality (2016)"
This infographic from The AP-NORC Center uses data from the 2016 Long-Term Care Poll to explore caregiving in the United States. It finds that many Americans have experience providing long-term care to a loved one or expect to do so in the future. State programs to provide paid family leave for caregivers enjoy wide support and a majority say they would be comfortable asking their employer for time off under such a program. Read More "Infographic – Supporting Long-Term Caregivers (2016)"
Recent years have seen an increasing focus on person-centered care, an approach to health care and supportive services that allows individuals to take control of their own care by specifying preferences and outlining goals that will improve their quality of life. 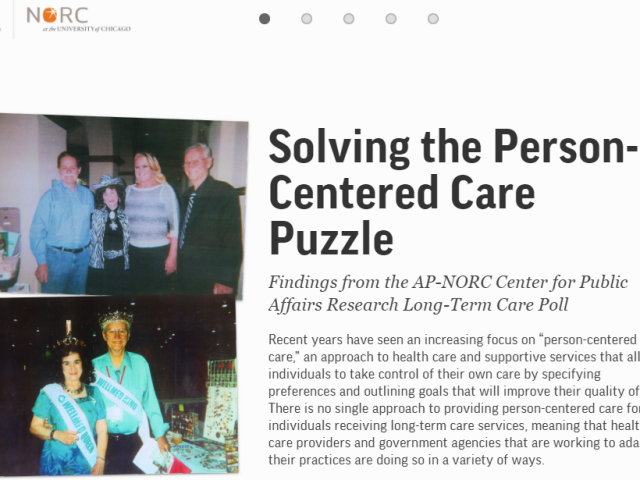 There is no single approach to providing person-centered care for individuals receiving long-term care services, meaning that health care providers and government agencies that are working to adapt their practices are doing so in a variety of ways. 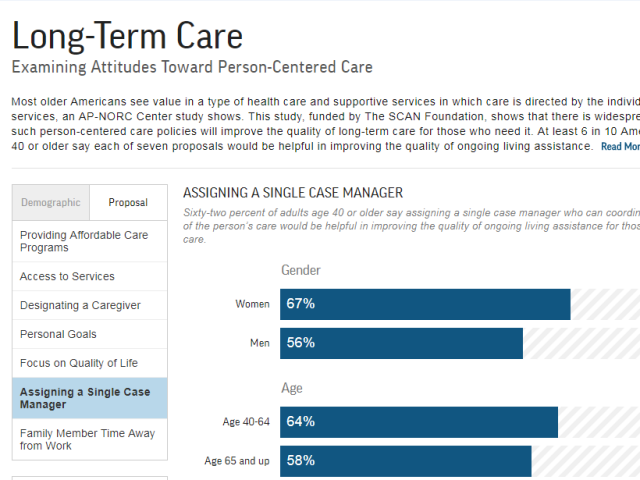 This interactive uses findings from the 2015 Long-Term Care Poll along with a personal story of the impact person-centered care had for one couple. 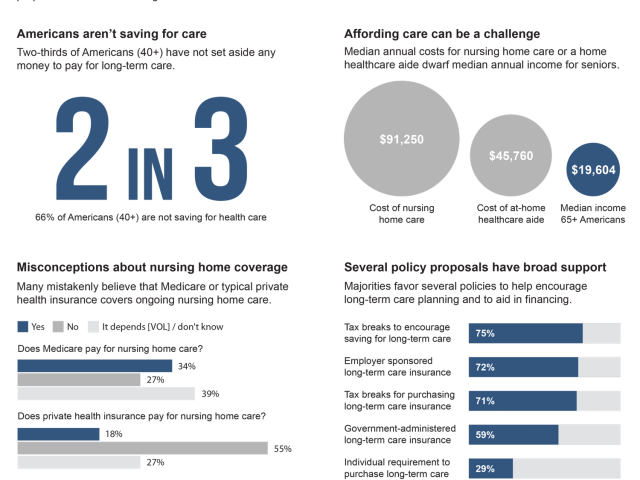 Read More "Video Interactive – Solving the Person-Centered Care Puzzle (2015)"
Using findings from the 2015 Long-Term Care Poll, this infographic shows that many are not saving for long-term care and lack knowledge about the role public and private insurance will play in helping them pay for care. But they support a variety of policy proposals to reform how long-term care is financed. Read More "Infographic – Many Americans Aren’t Prepared for Long-Term Care (2015)"
This infographic uses findings from the 2014 Long-Term Care Poll to show the growing need for long-term care services among Hispanic Americans. 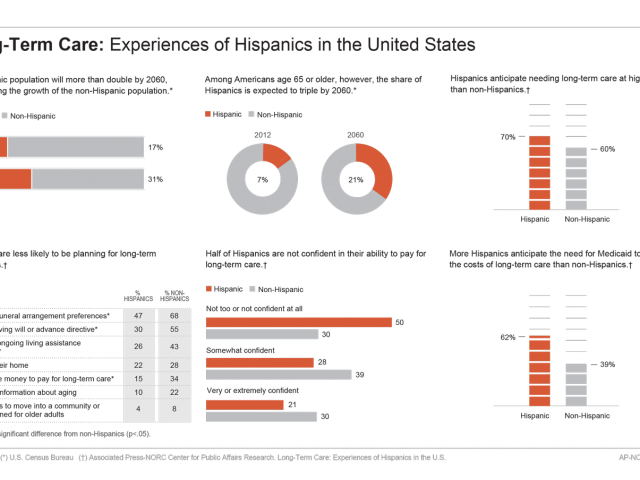 It also highlights the expectations and concerns of Hispanics age 40 and older regarding aging. Read More "Infographic – Long-Term Care: Experiences of Hispanics in the United States (2014)"
This infographic uses data from the 2014 Long-Term Care Poll to explore how many older Americans provide long-term care services to a loved one, who they provide care to, and the effect that caregiving had on their lives. 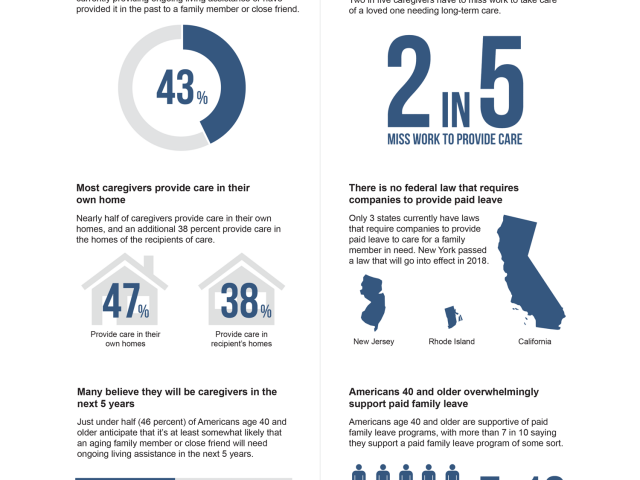 Read More "Infographic – Long-Term Care and the Impact of Caregiving on Familial Roles (2014)"
Most older Americans see value in a type of health care and supportive services in which care is directed by the individual needing services, an AP-NORC Center study shows. This study, funded by The SCAN Foundation, shows that there is widespread belief that such person-centered care policies will improve the quality of long-term care for those who need it. At least 6 in 10 Americans age 40 or older say each of seven proposals would be helpful in improving the quality of ongoing living assistance. Read More "Data Interactive – Long-Term Care: Examining Attitudes Toward Person-Centered Care (2014)"